Dr. Anoop Jhurani, Joint Replacement Surgeon, Best Hip Replacement Doctor in Jaipur and has performed many complex and revision hip replacements. He is equally proficient performing cemented and cement less hip replacements. NH 17 bye pass, Pantheerankavu, Calicut-673 019Kozhikode. Are you looking for Ligament Treatmentin Jaipur ? must visit Dr Vikram Sharma offer most advanced ligament injury treatment and medicine at Sports Med Hospital Jaipur. Fortis Escorts Hospital - Jawahar Lal Nehru Marg, Malviya Nagar,Jaipur. Looking for Arthroscopy in Jaipur must visit Sports Med clinic offer best knee, hip arthroscopy and Sports Medicine by most experienced Dr. Vikram Sharma at Reasonable rates. Stadium Road, Commerce Six Rd, Navrangpura, Ahmedabad, Gujarat 380009Ahmedabad. Apollo Clinic SCO - 10-11, Madhya Marg, Sector 8C, Chandigarh 160009 IndiaChandigarh. M-21, Mahesh Colony, JP Crossing UnderpassJaipur. B4, Gyan Bharati School Rd, Block D, Saket, New Delhi, Delhi 110017New Delhi. Get the best shoulder treatment by the Best Orthopedic doctor in Gurgaon. 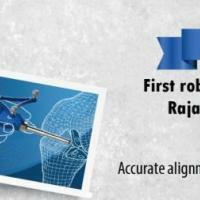 He has 25 years of experience in his field and also known as best shoulder doctor in Gurgaon. Dr. Pranav Shah is practicing as an orthopaedic doctor in Ahmedabad, Gujarat at CIMS Hospital, one of the top orthopedic surgeons in Ahmedabad, Gujarat Rajasthan. CIMS Hospital,Nr.Sukan Mall,Off Science City Road,Sola, Ahmedabad-380060.Ahmedabad. 4/5, Old Palasia, Ravindra Nagar, Indore 452018, Madhya PradeshIndore.